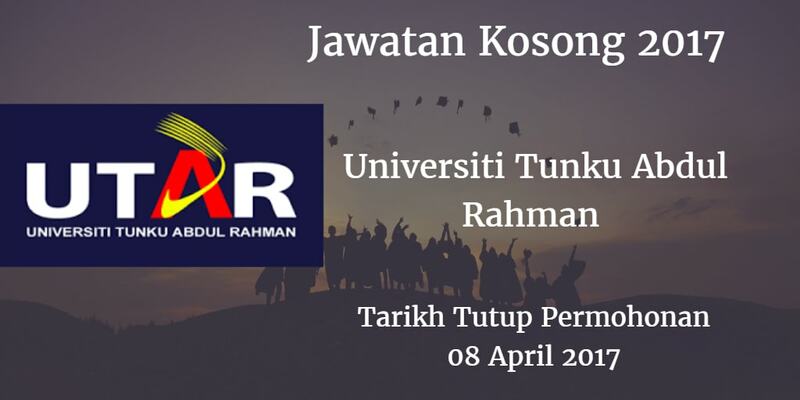 Universiti Tunku Abdul Rahman (UTAR) terkini terbuka sepanjang tahun 2017. Sukacita dimaklumkan bahawa terdapat pelbagai kekosongan jawatan Universiti Tunku Abdul Rahman (UTAR) akademik dan bukan akademik berikut. Peluang kerjaya di Universiti Tunku Abdul Rahman (UTAR). Universiti Tunku Abdul Rahman (UTAR) would like to invite qualified candidate to fill in below vacant position vacancy. Strong interest & expertise in teaching and research & be involved in scholarly activities. Mechanical, Manufacturing and Material Engineering: Mechanical System / Computer Integrated Manufacturing/ Product Development/ Refrigeration and Air-conditioning / Mechanical Vibrations / Computational Fluid Dynamics /Thermofluids / Combustion / Fluid Mechanics / Nanotechnology / Corrosion / Composite Materials / Nanomaterials/ Polymers / Ceramics / Electronics Materials and Manufacturing. Electrical and Electronic Engineering: Electrical / Microelectronic / Power System / Communication and Networking / Microprocessor and Embedded System / Computer Architecture / Signal Processing / Physics / Optics / VLSI & IC Design. Financial Accounting / Management Accounting / Corporate Reporting / Auditing/ Taxation / Forensic Accounting (preferably with practical experience and professional qualification) / Islamic Finance / Economics / Quantitative Techniques /Risk Management / Building and Property Valuation / Market Research / Law . Candidates without specialist qualification but with strong teaching, research/ publication record from reputable universities may also be considered. Candidates without specialist qualification but intend to pursue an academic career would be considered under the academic staff training scheme. Clinical Medicine: Internal Medicine / General Surgery / Orthopaedic Surgery/Paediatrics / Obstetrics & Gynaecology / ENT / Anaesthesiology / Psychiatry/ Emergency Physician / Ophthalmology / Family Medicine / Radiology / Community Medicine.